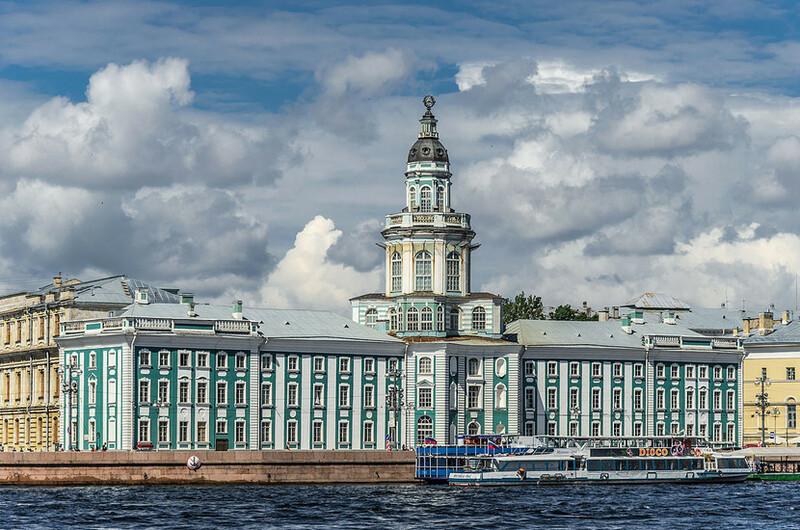 Long before the city of St. Petersburg was founded, Vasilievsky Island was known by two names. The first, surviving, name, is Russian: Vasiliev Ostrov, translating to “Vasily’s Island”. Although it’s not clear who Vasily may have been, one possible contender may be Vasily Korchmin, a gunner and military engineer in Peter the Great’s army who successfully warded the Swedish navy off the island. A statue to Korchmin may be found a couple of minutes’ walk from Vasilieostrovskaya metro station, sitting jauntily atop a cannon. The second name the island went by was Finnish, Khirvisaari, translating to “Elk Island”; a hint as to the island’s previous occupancy! Vasilievsky Island is full of places well worth exploring – from classy bars to alternative hangouts, all the way through galleries, theatres and monuments. If you have time, strolling aimlessly means you’ll almost certainly stumble on a hidden gem or two. 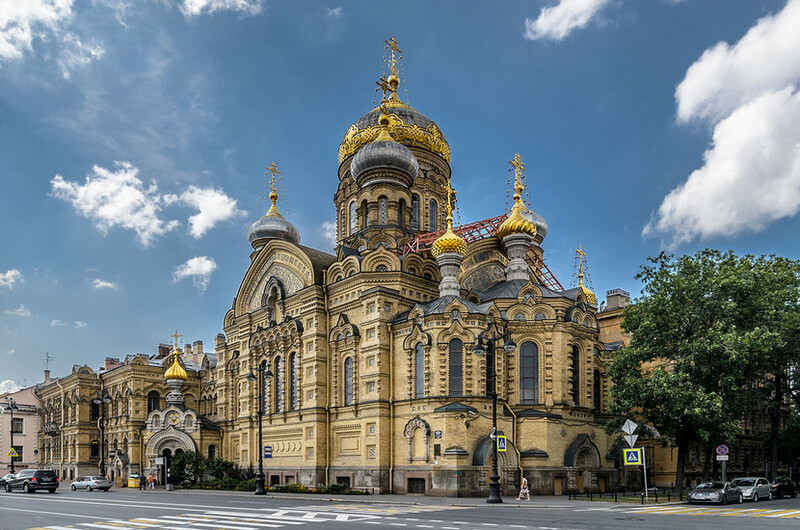 If you don’t have a huge amount of time, however, we’ve put together a short tour for you to follow, taking in some of Vasilievsky’s best spots. 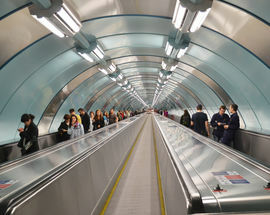 To start, take the metro to Sportivnaya station. Opened in 1997, it’s one of the city’s most modern metro stations and has a classical, Olympic-inspired theme; take a look at the mosaic representing Greek gods as you exit. You will come out onto Makarova Embankment. Named after Russian vice-admiral S. O. Makarov, this was a fishermens’ settlement in the 17th century, with stone buildings erected from the fi rst half of the 18th century onwards. The first place to note in the Pavlov Institute of Physiology. Most known for his work on classical conditioning, from which the phrase “Pavlovian reaction” is drawn, Ivan Pavlov became Russia’s fi rst Nobel laureate in 1904. He was also the Institute’s fi rst director, and a bust of the man himself now stands outside. Stemming from an initial goal of studying brain hemispheres and their physiology, by the 1930s the work undertaken by the Institute included brain hemispheres and their regulatory systems, nervous system types, experimental neuroses and nervous activity in primates. It remains important within the field, researching the fascinating workings of the human brain. Following the embankment round, you will see the Spit of Vasilievsky Island, flanked by the two large Rostral Columns. The Spit is a popular place for wedding photos – don’t be surprised if you see a bride or two! It’s also one of the best views in St. Petersburg so make sure you stand at the edge to have a look. 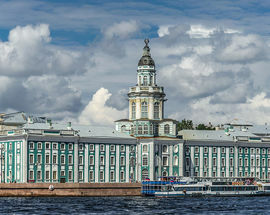 Some landmarks visible from the Spit are the Peter and Paul Fortress, the Winter Palace, St Isaac’s Cathedral, and the Admiralty. On a clear day, it’s possible to see for quite a long way; on a clear evening, the city glitters with lights. The enormous Rostral Columns dominate this part of the island. Erected in 1805-10 to celebrate Russian victory over the Swedish navy, the six rostra (prows of captured ships) on each column serve as a declaration of Russian military might. 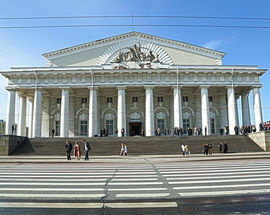 At the base of the columns, sculptures depict Russia’s great rivers in allegorical form; the Volga, Dnepr, Neva, and Volkhov, two of each on the north and south columns respectively. However, the columns are also functional; up until 1885 they served as lighthouses during nights and foggy days, and are lit to this day on holidays. Hidden inside the columns are spiral staircases which lead to the top and allow the beacons to be lit. Behind the Spit is another of Vasilievsky’s landmark buildings, the Old Stock Exchange. Erected between 1805 and 1810, it was inspired by the Greek Temple of Hera at Paestum and designed by French architect Thomas de Thomon. In 1826-32, the northern storehouse was added. It’s decorated with monumental sculpture symbolising maritime commerce and a powerful-looking Neptune. Turn the corner of the Spit and it’s time to go into some museums! First up is the Zoology Museum, one of the world’s largest natural history museums and home to a breathtaking variety of zoological specimens. Around 30,000 animals are currently on display within its halls, running a gamut of preservation techniques from pickled to pinned. 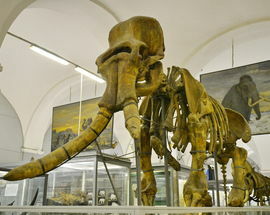 Notably, the museum boasts the world’s only stuff ed woolly mammoth. 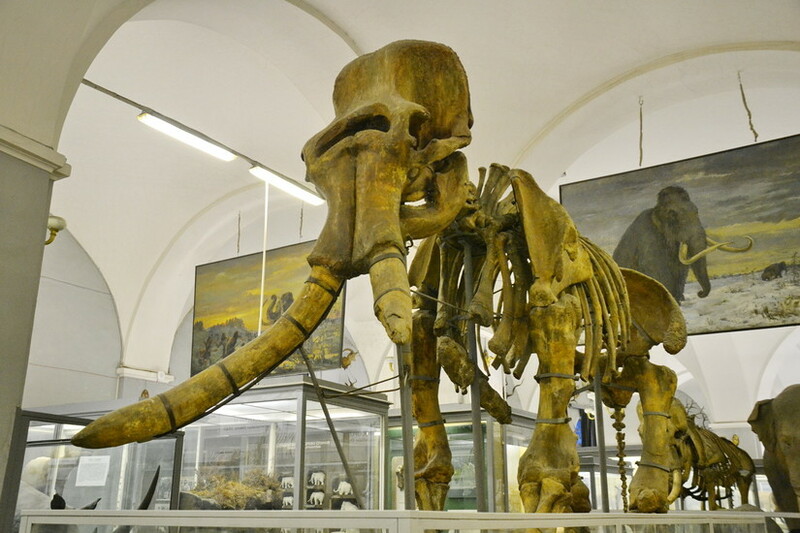 Over 30,000 years old, it was recovered from permafrost in the early 1900s and remains in surprisingly good condition. The museum is very oldschool – lots of glass cases, spartan labelling and little in the way of interactivity – but this just adds to its charm. Next up is Peter the Great’s infamous Kunstkamera. Opened to the public in 1714, the museum – of Anthropology and Ethnography – contains nearly a million arti​facts, and is one of the world’s most complete records of human cultural heritage. It spans Old and New worlds, with a breathtaking variety of artifacts from both. However, it’s most known for its ‘natural curiosities’, its human and animal specimens demonstrating medical anomalies. Preserved mainly in pickling jars, these include a mildly distressing amount of fetuses demonstrating the many and varied ways in which pregnancy can go wrong. It’s possible to skip this room if you don’t feel up to seeing two-headed babies; the museum has much more to off er. For those of strong stomach, however, it’s a really interesting insight into medical research of the era. The Kunstkamera has been symbol and figurehead of the Russian Academy of Sciences since its opening. Next are The Twelve Colleges. 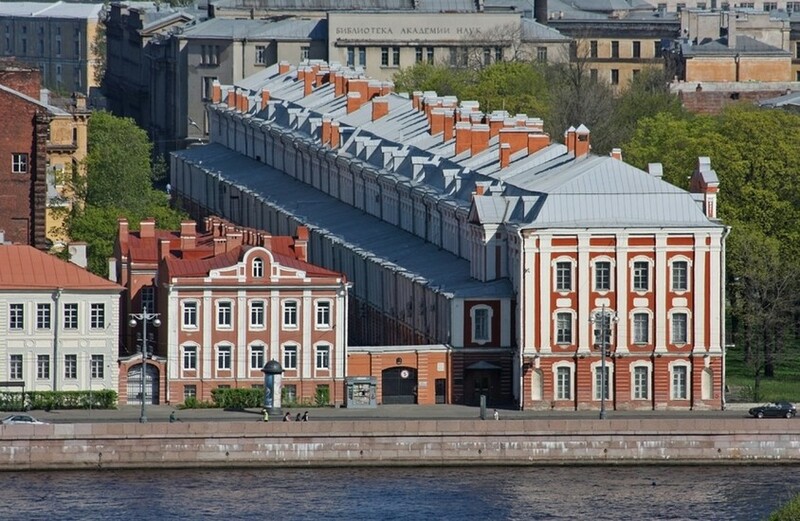 Completed in 1744, this building was originally designed to house the Russian government. 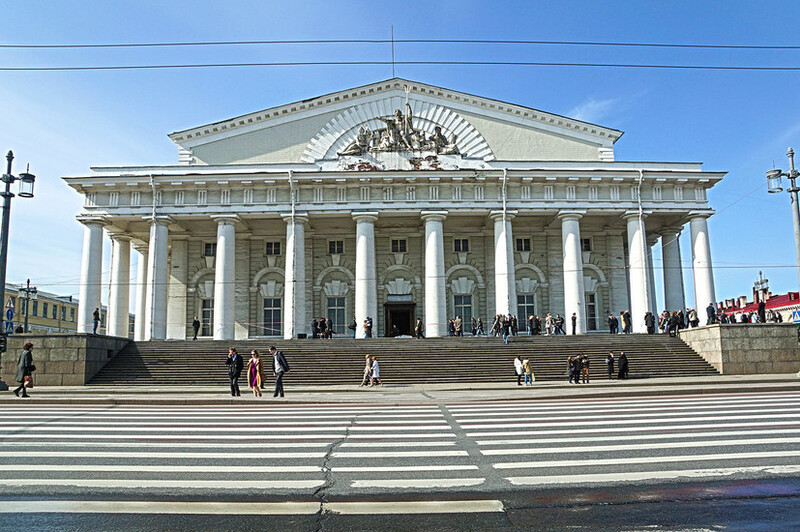 It was given to St. Petersburg State University and is now its main building. The University numbers a host of distinguished alumni, including Dmitri Mendeleev (of Periodic Table fame), Ivan Pavlov, Vladimir Lenin and Vladimir Putin (who both read Law, receiving their degrees in 1891 and 1975 respectively). The University now spills over to a number of nearby buildings and has around 20,000 students; the Twelve Colleges sits at its epicentre, rendered in Petrine Baroque style. Between the Twelve Colleges and the Academy of Sciences, you will see the monument to Mikhail Lomonosov. 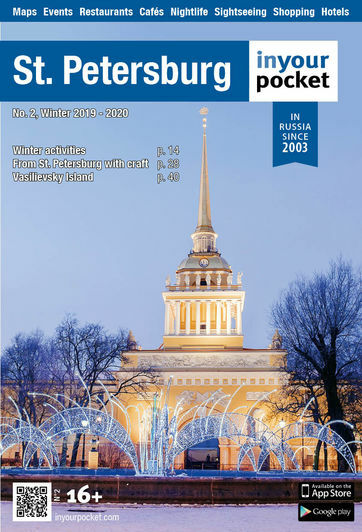 A polymathematical giant of Russia’s Enlightenment, Lomonosov was born in deep Northern Russia in 1711 to a peasant fisherman and the daughter of a deacon; by iron willpower and a few white lies (at the age of 19 he enrolled in the Slavic Greek Latin Academy in Moscow by claiming to be the son of a provincial priest) he went on to father much of Russian science, develop one of Russia’s fi rst grammar books, and write several volumes of history and poetry. He was an instrumental figure in the development of many surrounding institutions and rector of the Academic University (predecessor of today’s university) from 1758 until his death in 1765. Amongst his many discoveries was the atmosphere of Venus. 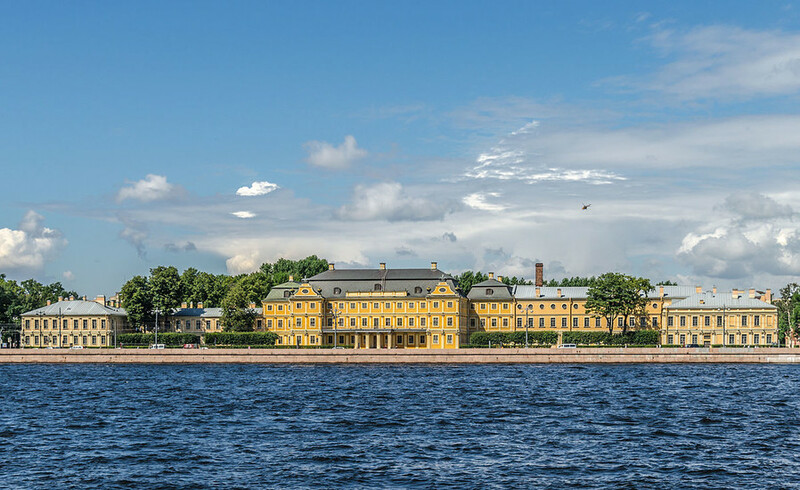 Moving further along University Embankment, the Menshikov Palace is worth popping into. 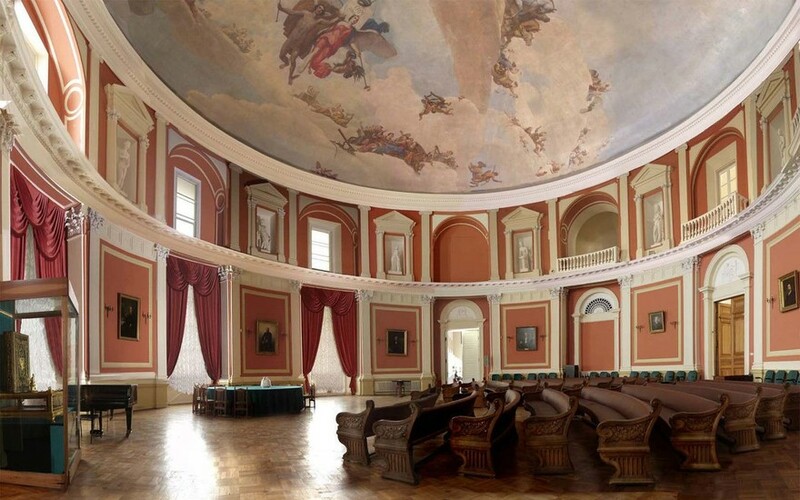 Part of the State Hermitage, but much smaller and quieter, its rusty orange walls conceal a luxurious palace interior carefully curated to display authentic works of art and interiors faithful to the past. Completed in 1714, this was the palace of Peter I’s favourite and at the time surpassed the monarch’s residence in elegance and design. Its upper windows permit rather nice views of the Winter Palace and St. Isaac’s Cathedral. Originally the main facade led directly to the river, with a constructed marina for boats to moor at and a landscaped garden. The sculptures and trees were later moved across the river to the Summer Garden, and the marina is no more. Next stop is the Russian Academy of Arts. It’s worth taking a while to stroll around its museum, which houses a unique collection encompassing both classical and contemporary art. 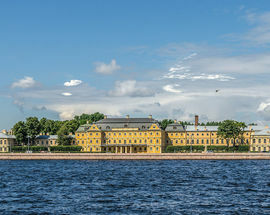 Founded in 1757, the Academy’s current building was commissioned by Catherine the Great in 1764 and took 25 years to complete. It underwent several name changes, and since 1991 has been called the St. Petersburg Institute for Painting, Sculpture and Architecture. Across the road from the Academy of Arts are some particularly interesting monuments; facing onto the river stand two sphinxes. Dating from the 14th century BC, they are around 3500 years old. In 1820, they were excavated from the temple of Amenhotep III, near the Egyptian city of Thebes, by a Greek archaeologist named Yanis Atonasis. Placed at the entrance to the tomb, they were originally meant to protect the Pharaoh as he lay in rest (and amongst treasure). One of the sphinxes was sent to Alexandria, where it was seen by Andrei Muravyev, a Russian writer and diplomat. 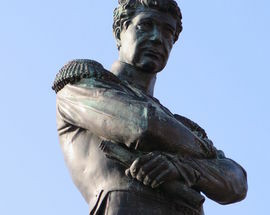 Keen to bring them back to Russia, Muravyev persuaded the Tsar to both approve of the plan and pay for the statues. A harder task was finding a ship willing to carry them – at a weight of 46 tons each, this was no small feat. Finally, an Italian ship agreed to take them, on a voyage which lasted a year, and the sphinxes arrived in St. Petersburg in 1832. 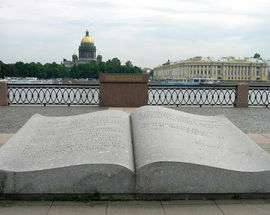 A little further down the same embankment is a much more recent addition to the city’s monuments; the Open Book sculpture was unveiled in 2002 and is officially named “The Message Through the Ages”. 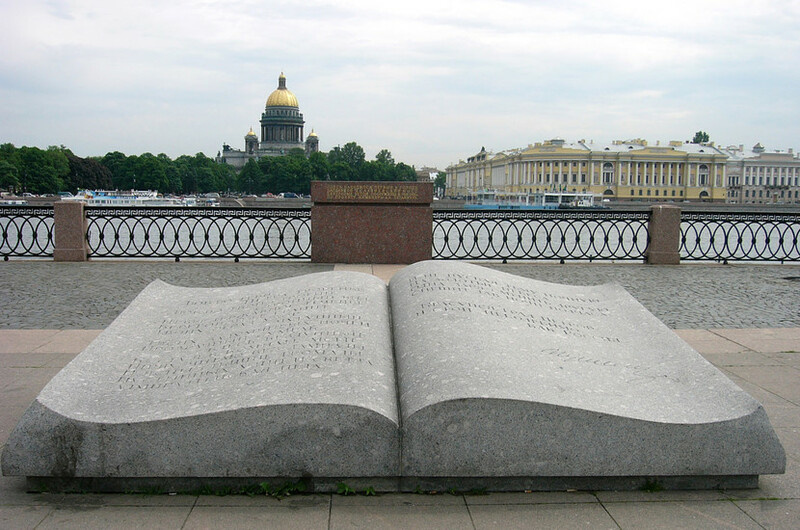 Facing the Bronze Horseman sculpture across the river, The Message Through the Ages bears verses by Alexander Pushkin from his poem of the same name: “I love thee, City of Peter’s making!” A giant stone book, it’s worth keeping an eye out just for the photo opportunities presented. Continue down the island’s embankment. 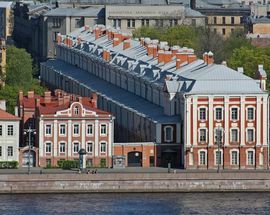 This route affords beautiful views of the Neva and buildings on the mainland. 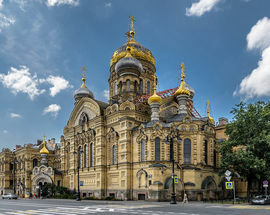 Ahead you will see the gold-domed Church of the Assumption of Mary; small and perfectly formed, it’s one of St. Petersburg’s loveliest churches. Built in 1897, it was used as a Soviet warehouse from 1935, not used for services again until 1993. It’s very much a working church today so ensure you have appropriate headgear should you wish to enter. To the left of the main door, the church also runs a small cosy cafe. A monument to Admiral Ivan Kruzenshtern is erected on this embankment. Of Baltic German descent, Kruzenshtern led both an expedition to the Far East and the first Russian circumnavigation of the globe. 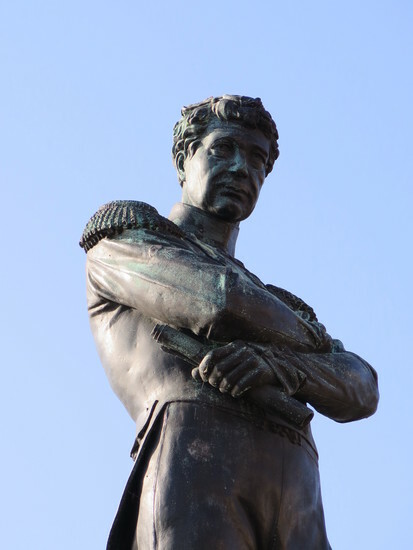 His monument has stood here since 1873; amusingly, it has become a (highly unofficial) tradition for graduating students of the Naval College to dress Kruzenshtern in a large telnyashka, the Russian Navy’s distinctive blue and white striped vest. 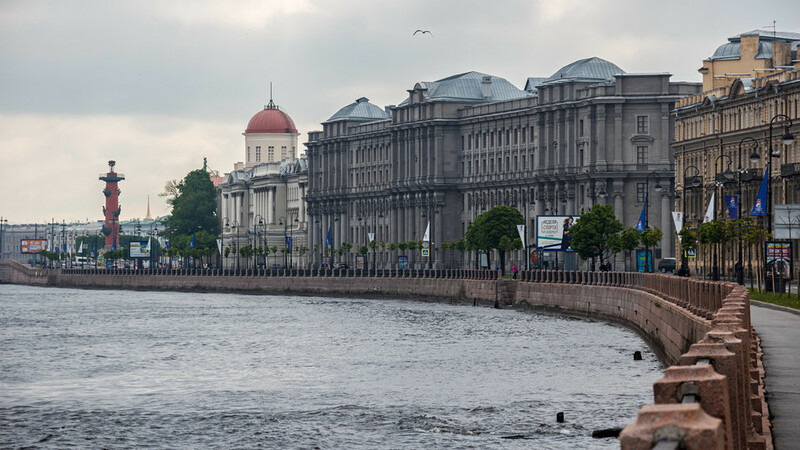 This side of the island is marked far more by St. Petersburg’s history as a port city. In the distance, cranes can be seen at work over the Neva. There are also boat museums which you can visit. The larger of these is the famous icebreaker Krassin. Built in Newcastle, England in 1916, this boat has a distinguished career in polar exploration and rescue, and was used by both Russian and British navies. Now decommissioned, it has been a museum since 1992. The first ship to reach the northern shore of Novaya Zemlya in 1993, the Krassin also famously rescued the Italian General Umberto Nobile and his crew following an Arctic airship crash in 1928. Active in the Second World War, this is a boat that has seen many adventures – very interesting to visit! Also of interest is the submarine S-189. This small museum gives an insight into what it would have been like to live and work on a submarine, with the interior largely preserved intact. Built in 1954, S-189 was decommissioned in 1990 and actually sunk in 1999, not raised and restored until 2005. To reach it you have to walk out on a wooden promenade, as it remains in the water. 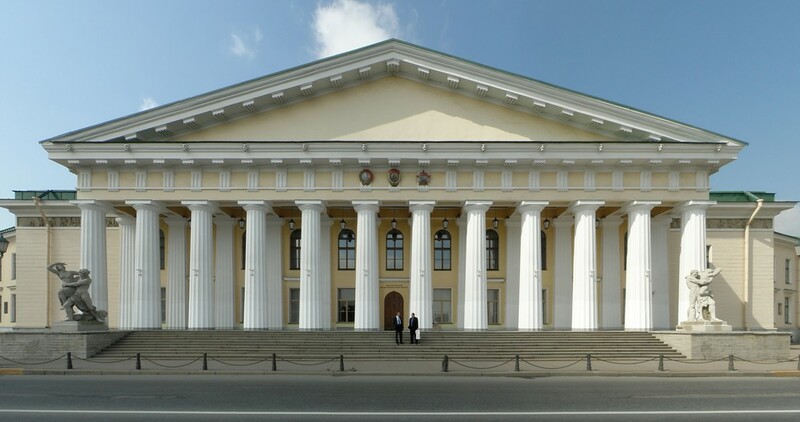 At the corner of the embankment is the enormous neo-classical building of the St. Petersburg Mining University. Two large sculptures flank its doors; on the left, Hercules defeating Antaeus, and on the right is depicted the abduction of Persephone. Classical Greek influence is obvious, as is the underlying theme of the Earth’s power; this is a building that oozes mightiness over the Earth. 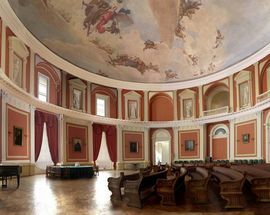 Many Russian rulers saw engineering and mining as vital in maintaining Russia’s status as a great power, and the Mining University’s grandeur demonstrates this. It was founded in 1773 by Catherine the Great to train engineers for the mining and metals industries. 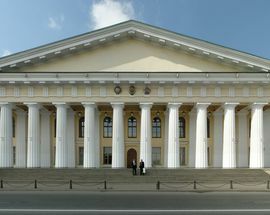 It is Russia’s oldest technical university, and unusual amongst non-military institutions in that its members wear uniform. Leaving the river and heading inland, it’s a short walk to Erarta, the museum of Contemporary Art spanning five floors. 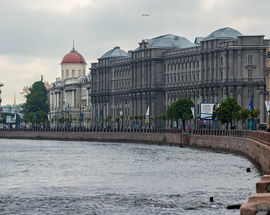 Showcasing Russian art produced in the last 60 years, the gallery is open until 22:00 and used by many St. Petersburg residents as a way to wind down in the evening. From the austere to the dreamy, their collection spans many different styles and themes – there’s always something to catch your eye. Their cafe serves some of the city’s best cakes if you need a little pick-me-up. From here, you can walk back along the river, catch a bus or tram to the centre… or continue exploring Vasilievsky Island.